NASA scientists successfully completed the second of six planned trajectory correction maneuvers and confirmed the health of science instruments onboard Curiosity this week. 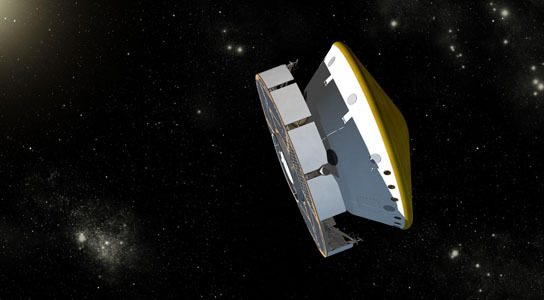 The Mars Science Laboratory spacecraft is continuing on its way to Mars and should reach the halfway point on April 1, 2012. PASADENA, California — NASA’s Mars Science Laboratory spacecraft, halfway to Mars, adjusted its flight path today for delivery of the one-ton rover Curiosity to the surface of Mars in August. Tests completed aboard Curiosity last week confirmed the health of science instruments the mission will use to learn whether an area holding an extensive record of Martian environmental history has ever offered conditions favorable for microbial life. In the second of six planned trajectory correction maneuvers during the cruise to Mars, the spacecraft ignited thrusters for nearly nine minutes today. Spacecraft data and Doppler-effect changes in radio signal from the craft, monitored in the mission control room at NASA’s Jet Propulsion Laboratory, Pasadena, Calif., indicate the maneuver succeeded. “We are now on a trajectory that will put us much closer to the point we want to hit on Aug. 5,” added Tomas Martin-Mur, navigation team chief for the mission. One of Curiosity’s 10 science instruments, the Radiation Assessment Detector (RAD) has been collecting data for three months, monitoring the natural radiation environment in interplanetary space. This information, particularly effects RAD has measured from recent solar flares, is crucial for design of human missions to Mars. In the past two weeks, the rover team has checked the status of the other nine of Curiosity’s science instruments, powering them on for the first time since before launch. All the instruments passed these checkouts. Curiosity’s landing site is near the base of a mountain inside Gale Crater, near the Martian equator. Researchers plan to use Curiosity to study layers in the mountain that hold evidence about wet environments of early Mars. First, the spacecraft must get there. Today’s maneuver nudged the spacecraft one-seventh as much as the flight’s first course adjustment, on Jan. 11. After the first maneuver, the trajectory would have put Curiosity about 3,000 miles (5,000 kilometers) and 20 minutes away from entering Mars’ atmosphere at the right place and time. Like that maneuver, today’s combined two ways of using thruster engines while the whole spacecraft spins at two rotations per minute. The spacecraft’s cruise stage carries eight thrusters grouped into two sets of four. The maneuver began with about three minutes of firing one thruster in each set to change velocity along the direction of the axis of rotation. Then, to push the spacecraft in a direction perpendicular to the axis, each set of thrusters was used for five-second pulses when the spacecraft’s rotation put that set at the correct orientation. The maneuver used more than 60 of these pulses spaced about 10 seconds apart. “The purpose is to put us on a trajectory to the point in the Mars atmosphere where we need to be for a safe and accurate landing,” said Mau Wong, maneuver analyst at JPL. The descent from the top of Mars’ atmosphere to the surface will employ bold techniques enabling use of a smaller target area and larger landed payload than were possible for any previous Mars mission. These innovations, if successful, will place a well-equipped mobile laboratory into a locale especially well suited for its mission of learning. The same innovations advance NASA toward capabilities needed for human missions to Mars. Be the first to comment on "NASA’s Mars Science Laboratory Spacecraft Adjusts Trajectory, Tests Instruments"